More than 100 commercial locations? Contact us for customized pricing. If your cleaning company is part of a franchise, or cleans more than 100 commercial locations each month, contact us to find out how we can work together. Do you have more than 100 commercial cleaning locations? Drop us an email if you couldn't find an answer to your question in the following list. Swept software is available to owners/managers as both a web-based and mobile app. This means you can access your Swept manager account from a web browser on your computer, or by downloading the mobile app onto your phone. There is no need to install any software on your computer. Your cleaners will have access to the mobile app on their phones. It's quick and easy to switch between our different pricing plans from your dashboard. Recording accurate time ensures you and your customers are getting what they are paying for. Swept allows your team to sign in and out with ease. For more information, go to our Time Tracking feature page. Swept makes shift planning easy! With Swept, schedule your cleaners efficiently and faster, increase profitability with less errors on scheduling, and keep everyone in the loop with better communication between you and your cleaners. For more information, go to our Scheduling feature page. Keep your team connected. We make messaging between your cleaners, managers and customers easy so that everyone is connected on one platform. Engage and retain your cleaners better and impress your clients. For more information, go to our Messaging feature page. You can configure email and/or SMS notifications to send an email and/or text messages Sign In, Sign Out, Problem Reported, Off-site Sign In, Off-site Sign Out, Poor Mood Reported etc. This feature allows you to stay informed. 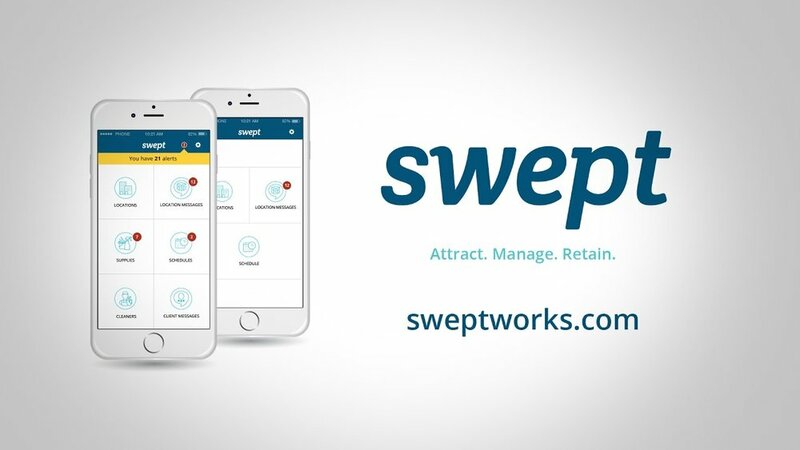 Swept's cleaning instructions feature is designed to help commercial cleaning companies improve profitability helping cleaners understand what success looks like on site. With Swept you can send your cleaning instructions to your team anytime, from anywhere. For more information, go to our Cleaning Instructions feature page. With this feature, when cleaners use the Mobile app or the IVR to sign in you’ll know if they are physically onsite or not. Swept's supply tracking feature allows you to track and order any supplies your cleaners need on site. No more phone calls or spreadsheets! For more information, go to our Supply Tracking feature page. All recorded time is logged in your web-based manager dashboard. The recorded time for each cleaner is imported automatically so your team can review and approve in minutes. Approved time can be adjusted as needed and exported to your payroll system of choice. For Quickbooks Online users, it's as easy as a single click. Swept provides an automated, easy-to-use inspection tool for your business. Take quality assurance to a new level with mobile inspections. With Swept, you'll be able to measure performance, and impress your customers. For more information, go to our Cleaning Inspections feature page. Swept's problem reporting feature will help you address on site issues proactively, rather than hearing about it from your clients. Swept makes it easy to manage, track, and resolve problems. When problems are reported, your managers will know immediately. For more information, go to our Problem Reporting feature page. Swept's public survey feature gives you a channel for your janitorial company to collect valuable feedback. Getting in front of an issue before it's reported to your clients is a great way to make sure they see the value in your cleaning services! For more information, go to our Public Surveys feature page. Do you want to speak your cleaner's language? With Swept, your cleaners can read instructions in their native language with just a click! You'll be able to speak 100+ languages. De Nada! For more information, go to our Enhanced Translation feature page.